The Open Cockpit Biplane Adventures of Michael McCafferty, touring the USA and Europe. This story was printed in the Waco World News, July/August 2003. Copyright 2000 by the author, all rights reserved. It was a perfect spring day in Del Mar, California. The onshore wind was light, the sky clear, and although it was almost sunset, the air was still warm. I was standing on my west facing, second floor balcony, 50 feet from the edge of the cliff, with a view for miles along the Pacific coast. On this stage stretched out before me, life was being lived in all its glory: dolphins playing in the waves, surfers lazily waiting for the next set, pelicans gliding effortlessly on almost nonexistent puffs of air pushed up by the slightest swells. As I breathed in this magnificent scene, it was only natural to think of Flying, and my open cockpit biplane, "The Spirit of Adventure", which at that moment was enduring the indignity of being stripped, poked and prodded by mechanics giving it a thorough annual inspection. I knew it would pass as easily as I passed my pilot medical checkup last week. All systems were "Go" for my seventh summer in the air. And yet, a dark and melancholy thought had been nagging at me lately: "When does one stop flying?" This question was so foreign to me because flying was an obsession, an addiction. I needed flying like my lungs need air. I won't bore you, dear reader, with stories of my exploits, which have been well below the level of legends like Lindbergh, Saint-Exupery, or Mermoz. I was so careful that I never even scratched any of the great airplanes I flew. I was never betrayed by an airplane, never had to deal with an engine out, or fire in flight. My logbook totals a measly one thousand hours in only 6 years. But my time aloft was far from boring, at least to me! I was unbelievably lucky to learn flying, and get my license, in the most excellent open cockpit biplane of all time, a work of vintage art that I owned and could fly at my whim. Together, we toured all over the USA and Europe, from border to border, coast to coast and all in between, on months-long barnstorming adventures-of-a-lifetime. Each flight was a miracle. Together, we struggled for air, cresting the Rockies and the Alps, and crossed the Irish Sea, the Baltic, and the Channel. We boiled over deserts, froze in the mountains, and survived weather that seemed bent on extracting the ultimate price. Like aliens, we dropped from the sky and landed in hundreds of exotic places big and small. There were close formations, dogfights in play, lots of aerobatics, even near misses and other heart stopping frights. "When does one stop flying?" An answer came into my head: "If you are thinking about not flying, then you shouldn't be flying." It seemed true, because it is the corollary to the proposition that states that while one is engaged in the art of flying, one must be thinking only of flying." It was a quick and simple answer, but I didn't like it, and rejected it immediately. At this precise moment the duck appeared, entering the left corner of my left eye, flying fast and low (we have a lot in common! ), following the path at the edge of the cliff. He was all business, flying straight as an arrow, not a moment to lose. Probably late for dinner with the wife and kids, and wanted to get home before dark. That was the entirety of my thinking about this duck, lasting for all of a second or two at the most. An insignificant thing. The thought drifted back into my mind: "If you are thinking about not flying, then you shouldn't be flying." It seemed too easy. I was looking for a better answer. The duck then made an instantaneous course change (about 45 degrees) and headed directly my way! What made it even more curious was that he never wavered, never skipped a wing beat, never slowed. For the first quarter-second of this new behavior I was merely interested. What could he be going after in my general direction? In the next quarter-second I realized that he was doing something very strange. There was nothing of interest to a duck in my general direction. What was even more unusual was that not only did he change heading, he changed altitude. My balcony is a full 15 feet above his previous cruising altitude. It dawned on me that he was not making a course correction to avoid something in his path, he was not going after something I hadn't yet discovered, he was heading with laser accuracy at a point between my eyes! Did I miss something in my education? Do ducks attack humans? Within that moment of awareness, this duck showed up, full speed, 2 feet from my face. I just started to take evasive action (yes, I know, I could have said "duck") when he did the most spectacular thing I have ever seen done by any flying creature. He stopped in mid air with a tremendous flapping of his wings, acting as an air brake, almost hovering for an instant, showing perfect control. He then executed a sensational wingover and spiraled down to land on the grass, and without so much as the slightest extra movement of a feather, he stood there like a statue and looked up, unblinkingly, into my eyes. It occurred to me that in some cultures, this would be considered an omen. But what could it mean? For the answer, I tried to remember what I was thinking when this creature (this Messenger?) showed up. Of course: "If you are thinking about not flying, then you shouldn't be flying". A few moments passed while I tried to figure out what was going on, and all the while the duck remained absolutely motionless, staring up at me with rock solid eyes. I couldn't allow myself to believe all of this. Any reason I could invent for his performance was beyond comprehension. But there he was! I regained my composure, took a deep breath, and formed that fearful, fateful thought as a question for my visitor: "Is that why you are here, to confirm my intuition that if I am thinking about not flying then I should not be flying?" The very moment I finished asking the duck this question (telepathically, of course, because I am not given to talking aloud to poultry), he immediately lifted up, returned to his original course and altitude and was gone as if nothing at all out of the ordinary had happened. For quite a while after that event I considered other possibilities for the meaning of it all. At one point I even wondered if I might have had a run-in with this duck on one of my low flying capers. Did I scare him with a near miss, and this was his way of getting back at me? No way, he would never be able to recognize me without my helmet and goggles. So why did this happen? To me, there was only one explanation: the duck was a Messenger, pure and simple. The message was clear, not a shadow of doubt. I haven't flown my biplane since that day, and I have never regretted the message that was delivered to me. The time had come. I felt it coming for some time. I knew the moment of decision was near, and somehow, at just the right time, this clairvoyant, duck came along with the answer to the ultimate question of "When?". One of the reasons I had been delaying answering this big question was that I didn't have my next move figured out. If I wasn't going to be flying, what could possibly take its place? Without that question answered, I was stuck. Then the duck confirmed that the need for a safety net is all in the mind. Looking at it philosophically, and metaphorically, I saw that it was just one more flight into the unknown. In this light, I eagerly looked forward to the new adventures that would soon be revealed. When one door closes, another opens. Yin and yang. All things are perfect. Now I do a different kind of flying. Whether I am sitting in rush hour traffic, or walking on the beach, all I need to do is look up and my thoughts and feelings fly me in a sky of low scattered puffball clouds, a throbbing radial engine pulling me along on fabric covered wings, the wind in my hair, the tug of the stick on my right arm. Sometimes the air is crisp and wet from early morning ground fog, sometimes salty from the surf spray, and sometimes heavy with the scent of young jasmine flowers, lining a wandering valley stream. My flying machine is always full of gas and oil, freshly washed and polished. The weather is always just right, and always different. Control towers and radios have yet to be invented. My aerobatics are flawless, and every landing pure joy! I fly alone or with good friends, always at the perfect time, always without rush or compromise. Just before falling asleep each evening, I cut the engine, rudder into a radical sideslip, wing wires whistling, and drop low over the trees for a three-point dead-stick landing on a manicured field of soft smooth grass, at the edge of the sea. Lindbergh looks on, smiling. I sleep snug beneath the wing, dry against the dew, the full moon rising, and I dream of the day just done, and the day to come. And it is all very, very good. © copyright 2000, Michael McCafferty, all rights reserved. Special thanks Mom and Dad, and to flying mentors Art, Bill, Budd, Carl, Larry, Lowell, Mattias, Mike, Rene', Vince, and too many others to list. Update: August, 2003. 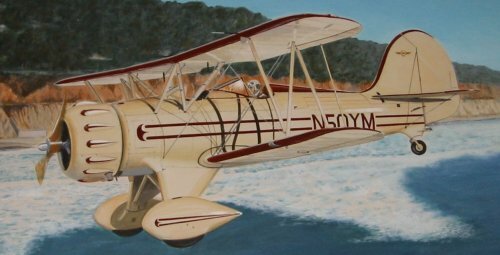 My magnificent open cockpit biplane (Waco YMF-5, N250YM) has been sold. My post-duck days are filled with the activities of an advisor to entrepreneurs, computer guru, banker, writer, photographer, yogi, freestyle Frisbee player, pool shooter, and an enthusiastic participant in an ever-changing variety of other pursuits... on the surface of the earth. I secretly wish the duck will come back.